February is National Pet Dental Health Month; the perfect time to take your pet to the veterinarian for a dental checkup. For the other months of the year, there are some simple dental care steps that you can put into practice at home. Here, the local veterinarians of Animal Medical And Surgical Clinic in Wisconsin Rapids share three tips for keeping your furry friend’s teeth and gums in top shape all year round. 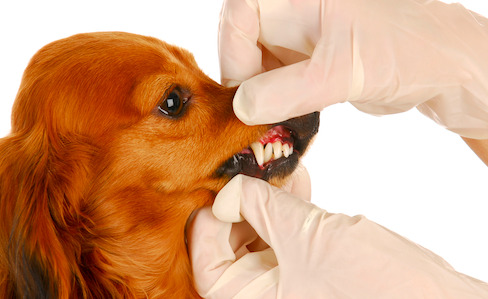 Dogs and cats are susceptible to some of the same dental issues as humans, including plaque and tartar buildup, tooth loss, and periodontal disease. A daily tooth brushing can prevent such problems and is an essential part of pet care. Brush your pet’s teeth at least a few times a week—ideally every day. That said, getting your pet to accept tooth brushing can be a challenge. This video—made for National Pet Dental Health Month—gives pointers on how to acclimate your pet to brushing. Getting your pet to accept tooth brushing comfortably will be easier if you use the right products. A finger brush is the easiest way to get the job done. Don’t ever use human toothpaste, which has foaming agents that can irritate an animal’s stomach. Look to your veterinarian for tips on appropriate products. Certain pet foods are specially designed to support tooth and gum health. Tartar control treats and chews are useful for keeping plaque at bay, while certain dietary supplements help build healthy teeth. Your veterinarian can recommend treats and foods that will address your pet’s needs. Like humans, sugar is a major culprit for dental problems in animals—so don’t share your sweet treats with your pet. If you’re in need of a reliable veterinarian in the Wisconsin Rapids area, look to Animal Medical And Surgical Clinic. Visit their website to find out more about their services and make an appointment by calling the local veterinarians directly at (715) 421-2006.